Voters in the U.S. will soon find out what Congress will look like during the final two years of President Donald Trump's current term. Record early voting numbers point to higher than average midterm turnout. 1st polls close at 6 p.m. ET, in parts of Kentucky and Indiana. 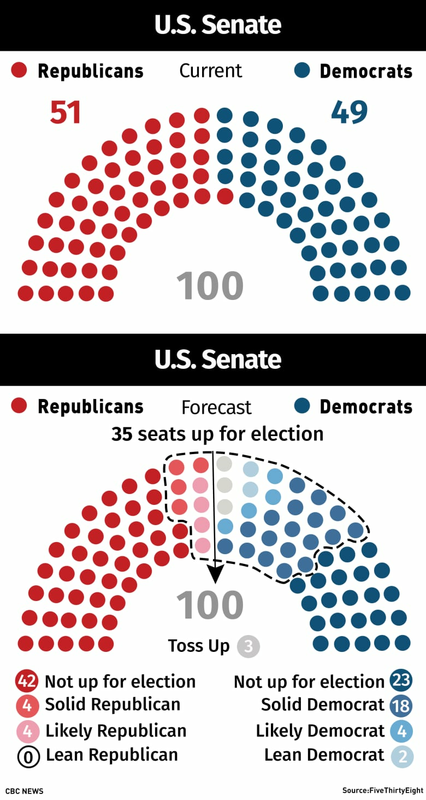 35 Senate seats in play. All 435 House of Representative seats contested. With polls in parts of two states slated to close at 6 p.m. ET, American voters will soon begin to find out just what the U.S. Congress will look like during the final two years of President Donald Trump's current term. Millions of voters cast ballots across the country on Tuesday, with some facing long lines and malfunctioning machines that marred the first few hours of voting in some precincts, including in Georgia, where voters reported waiting up to three hours to cast ballots in a hotly contested gubernatorial election. Tuesday's vote will decide whether Trump will continue to be backed by a Republican-controlled Congress through the final two years of his term, or if Democrats will be able to provide a check on his authority. It will also be Americans' first chance to weigh in — en masse — on Trump's style of government. 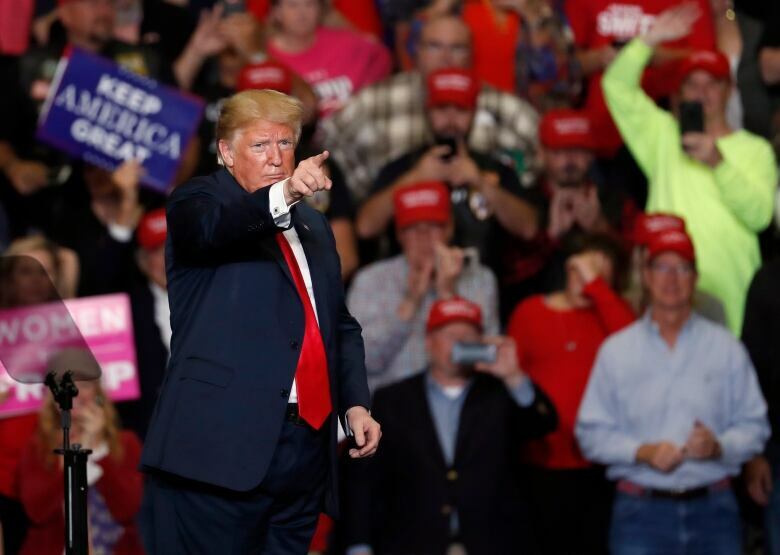 "In a sense, I am on the ticket," Trump told a Cleveland rally, one of three stops he made Monday across as many states in a last-ditch attempt to get Republicans out to vote. It's a proposition all first-term presidents face, and the feedback has often been unkind. Democrats were drubbed in the first midterm vote after Barack Obama and Bill Clinton were elected as presidents, while Republican George W. Bush emerged unscathed in 2002, likely buoyed as Americans united after the Sept. 11, 2001, attacks. Those results have reflected the fact that registered Republicans traditionally are more likely to head to the polls for midterm contests, though Trump's divisiveness is leading to hopes on the left that there will be a tide of Democratic voters, leading to the so-called blue wave result in their favour. The results will begin to pour in at 6 p.m. ET in the first states, with the majority of polls in the U.S. closing three hours later. You can watch television coverage on CBC News Network beginning at 5 p.m., with an America Votes special edition of The National starting at 8 p.m.
You can follow along on CBC's live blog at 7 p.m. ET and throughout the night, with extensive CBC Radio coverage beginning at 8 p.m. ET. While the political pundits may ultimately analyze Tuesday's results as a referendum on Trump, many Americans will undoubtedly base their vote on factors other than their feelings about the president: economic indicators, health care, tax reform, immigration or just their overall comfort level with the direction the country is headed. The first polls to close will be at 6 p.m. ET in parts of Kentucky, where the state's 6th District congressional race has been getting considerable attention as a potential national bellwether, and in Indiana. Alaska will be the last state to vote, finishing up at 1 a.m. ET. 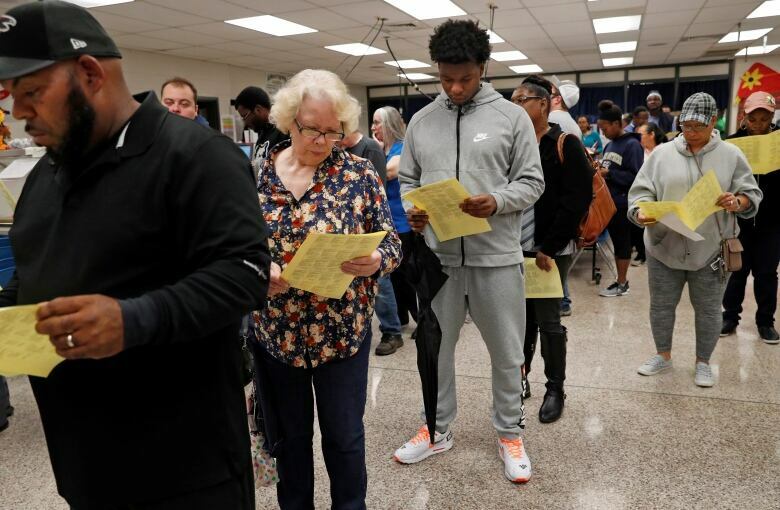 More than 100 people took turns sitting in children's chairs and on the floor in one polling place in Snellville, Ga., while voters in Atlanta waited in lines outside a seniors living complex that stretched around the building. There had been concerns expressed that voter ID requirements in the handling of absentee ballots and other issues in a handful of states could cause confusion among voters and poll workers. "We expect poll workers will be overwhelmed, just as voters are overwhelmed, and there will be lots of provisional ballots," said Sara Henderson, head of Common Cause in Georgia. Jay Hutchins, a 49-year-old Democrat who voted in the Washington suburb of Silver Spring, Md., was among those dissatisfied with Trump and the Republican-led Congress. "I'm not pleased with Trump's leadership at all. I think he's trying to divide this country," said Hutchins, a non-profit group's executive director. "I think he's preying upon people's fears. I think we need a president and leadership that appeals to the better angels of folks." In Ohio, Judy Jenkins, a 60-year-old Republican, blasted Democrats for their treatment of Supreme Court Justice Brett Kavanaugh during his bitterly fought confirmation process, a potential vote driver. Trump's racially tinged pitch is riling Latino voters. Could it help turn Arizona blue? Jenkins planned to vote exclusively for Republican candidates. Republicans "have actually brought the change," she said. "That's why our economy is growing like it is. They may not be perfect, but who is?" Trump did not have to brave the lines, with the White House saying the president and his wife, Melania, voted in New York via absentee ballot several weeks ago. While it may be known within hours which party has won control of the Senate and House, the numerical breakdown could take days or even weeks to learn, given the number of seats in play, mail-in ballots that need to be tabulated and potential recounts. There will be 35 Senate elections tonight across 33 states. Republicans currently hold a 51-49 edge in Senate seats and are a strong favourite to retain control of the legislative body, as Democrats and their independent colleagues have to defend 27 seats, including in states that went heavily for Trump in the presidential election. If one or more Democrats fall — the likeliest candidates are believed to be Heidi Heitkamp (North Dakota), Claire McCaskill (Missouri) and Joe Donnelly (Indiana) — the party's chances of retaking the Senate are slim at best. Republicans are defending just eight seats, including where Republicans Jeff Flake (Arizona), Bob Corker (Tennessee) and Orrin Hatch (Utah) are retiring. Former presidential nominee Mitt Romney is considered a lock to take over Hatch's seat, with his previous criticisms of Trump potentially making him suited to take the mantle from Corker and Flake, who have often rebuked the president for his politically incorrect rhetoric. All 435 House of Representative seats will be in play. The current session comprises 235 Republicans, 193 Democrats and seven vacant seats (five of which were last held by Republicans). Democrats would need a swing of at least 23 votes to gain control of the House. There will be dozens of new faces in the House, as some 55 representatives are leaving office or running elsewhere. Current Republican House Speaker Paul Ryan of Wisconsin is among those departing. If the Democrats take the House and the Republicans take the Senate, as most predict, it remains to be seen if a bipartisan spirit could emerge to tackle complex issues such as comprehensive immigration reform, or if rancour will continue to be the dominant theme. A Democratic win in at least the House could ratchet up the pressure personally on Trump. Republicans in the House the past two years looked to tamp down inquiries into potential Russian co-operation with Trump's campaign team during the 2016 presidential election, but Democrats may start requesting testimony from people in Trump's orbit. Democratic control could also mean additional oversight of the administration's regulatory agencies, with people like Interior Secretary Ryan Zinke — facing ethics breach allegations — potentially in their crosshairs. 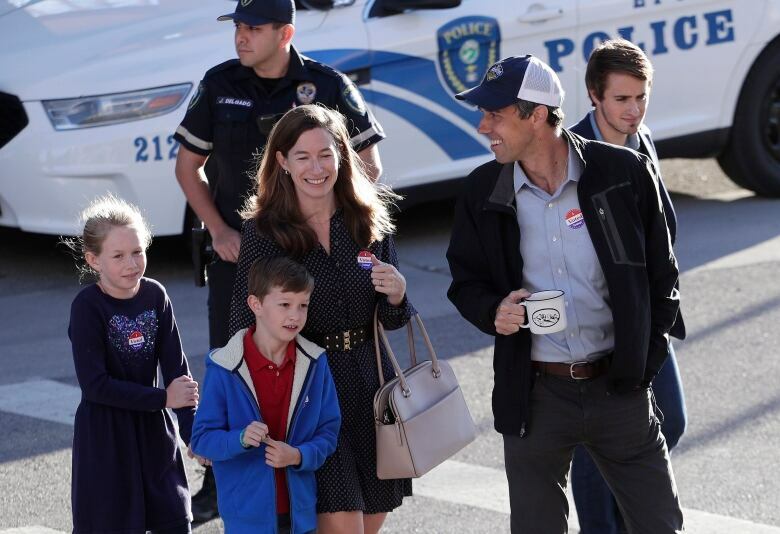 While most of the attention understandably has been on the U.S. Congress races, 36 gubernatorial elections are being contested today, including in eight of the 10 most populous states. Governors elected tonight will still be in power in 2021, when they can sign off on or veto redistricted boundaries for future U.S. congressional races, based on the 2020 census figures. These battles have been fraught in recent years, with legal challenges from the last round of redistricting leading all the way to the Supreme Court due to allegations of wanton partisan gerrymandering. Gubernatorial races in Florida and Georgia have been fraught with allegations of voter suppression and coded racial rhetoric, while the two main Illinois candidates raised eyebrows by pouring in $284 million of their own money into the fight. 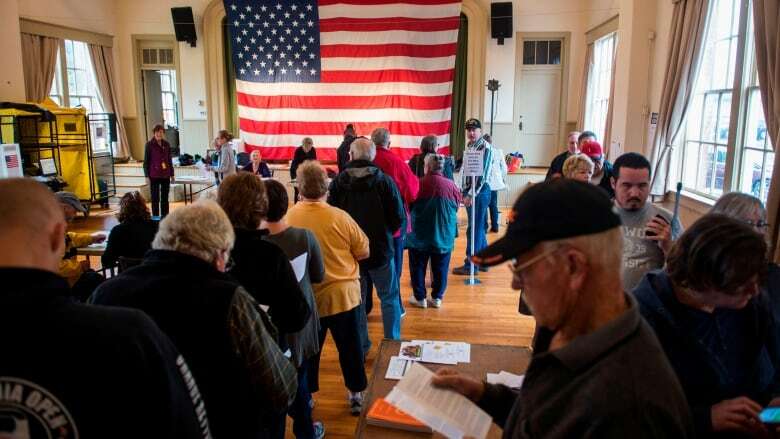 More than 31 million Americans already have voted, up from 22 million early voters four years ago, according to Catalist, a data company that compiles totals of ballots cast, either early in person or by mail. Given those numbers, midterm turnout could be the highest seen in decades. Only 37 per cent of eligible voters participated in the 2014 midterms, down five percentage points from the 2010 vote.